Approximately half the seafood eaten worldwide—including in the United States—is farm-raised. Because harvest from many wild fisheries has peaked globally, aquaculture is widely recognized as an effective way to meet the seafood demands of a growing population. As a result, aquaculture is the fastest growing form of food production in the world. However, the U.S. aquaculture industry has not kept pace with demand. The U.S. imports 90 percent of its seafood, half of which is farm-raised. China is the top aquaculture producer in the world, while the U.S. ranks 13. Like any type of farming, aquaculture can affect the environment. While the U.S. Food and Drug Administration (FDA) is responsible for ensuring that seafood imports are safe for U.S. consumers, the U.S. government cannot regulate the environmental impacts of international fish farms. In contrast, state and federal regulations ensure that fish are raised sustainably on Wisconsin farms. Discharges from aquaculture facilities must meet the standards of the Environmental Protection Agency as well as stringent state and local regulations. The FDA conducts inspections and collects and analyzes samples of feeds and fish to ensure that unsafe levels of any compounds used in animal production do not appear in the marketplace. In 2005, the University of Wisconsin Sea Grant Institute published “Best Management Practices for Aquaculture” to provide guidance to Wisconsin fish farmers on how to minimize or prevent any adverse environmental effects, maximize the health and well-being of the fish being raised and produce fish efficiently and economically. Water use is regulated by the Wisconsin Department of Natural Resources (DNR), and conservation practices are encouraged. On most Wisconsin fish farms, the water used for the production of fish may be reused or cleaned before being returned to the environment. The state also established the Wisconsin Fish Health Program, which provides guidelines on how to keep fish healthy in order to avoid the need for antibiotics. The program has been a model for other states trying to maintain fish health and improve fish production efficiency. Depending on their life stage, fish farmed in Wisconsin are either fed a natural or prepared diet. Young fish, especially yellow perch that are raised in outdoor ponds for the first few weeks of their lives, rely on natural populations of zooplankton. However, because proper nutrition is essential for fish growth and development, the majority of farmed fish are fed prepared diets. The optimum diet provides the essential protein, carbohydrates, lipids and vitamins in the proper amounts to help the fish grow, reproduce and stay healthy. Many of the fish preferred by consumers, such as salmon, perch and trout, are carnivorous. 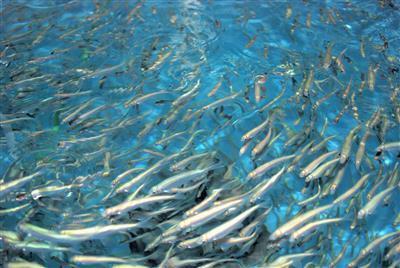 As a result, when they are raised on fish farms, these fish eat diets that contain wild fish. Although this means that wild fish are harvested to produce farmed fish, it’s important to remember that fish are generally much more efficient at turning feed into muscle (meat) than cattle, pigs or poultry. This is because fish are essentially weightless in water, so they do not need to use much energy to move. They are also cold-blooded animals, so they do not need to use energy to maintain the high internal body temperature that warm-blooded livestock do. Currently researchers from the National Oceanic and Atmospheric Administration (NOAA) and the U.S. Department of Agriculture are working to develop plant-based feeds with the right balance of proteins and fatty acids to replace fishmeal in aquaculture feeds. Visit this NOAA Fisheries website for more information about aquaculture feeds. According to the Wisconsin Aquaculture Association, Wisconsin fish farms sell more than $14 million annually, producing $21 million in economic activity and creating 441 jobs. Wisconsin ranks #1 in the Midwest in sales of aquaculture products and 20th in the nation. Fish raised on Wisconsin farms are highly regulated. The U.S. FDA tests fish feeds for unsafe levels of contaminants and prohibits the use of growth hormones. Although fish farmers in some other countries regularly add antibiotics to their fish feed, the FDA prohibits the use of antibiotics for non-therapeutic reasons and requires a veterinarian to approve their use. In addition, the Wisconsin Department of Agriculture, Trade and Consumer Protection (WDATCP) oversees a fish health program that includes health standards for fish and provides fish health certification for veterinarians.